In one corner of the world, there is more ice today than there was 10 years ago. New satellite data shows that the glaciers in the Karakoram have grown slightly over the last decade, bucking the global trend. We don't know why it has happened - but it's important to keep it in perspective. 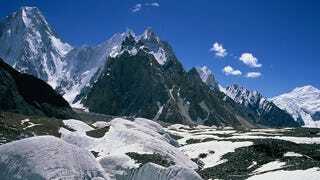 The Karakoram is a large Asian mountain range next to the Himalayas. It includes K2, the second tallest mountain in the world. While the Karakoram is home to many of the world's glaciers, there is little data on their behaviour because it is so remote. Now Julie Gardelle of the University of Grenoble in France and colleagues have used satellite data to build two pictures of the Karakoram's glaciers, from 1999 and 2008. That tells us how they have changed. Gardelle found that the glaciers grew slightly, adding an extra layer of ice that equates to an 11-centimetre thickness of water every year. By taking up this extra water, the glaciers prevented about 0.01 millimetres of sea level rise per year. "We don't really know the reason... Right now we believe that it could be due to a very specific regional climate over Karakoram because there have been meteorological measurements showing increased winter precipitation; but that's just a guess at this stage." The Karakoram study comes hard on the heels of another paper, published in February, which looked at the Himalayas themselves. The conclusion: the Himalayas have lost mass, but not as quickly as we thought. The new finding has led to a predictable swathe of media coverage, not all of it sensible. The UK's Mail Online would have us believe that we should "Forget global warming: Scientists discover glaciers in Asia that are getting bigger". The site later amended the headline to "New question mark over global warming" - which is not much better, and detracts from what is, below the headline, a perfectly measured story on the science. The reality is that the Karakoram is an oddity, albeit one that deserves attention. Millions of people rely on the runoff from its glaciers, so it's important to understand what is happening to them. "With glaciers and ice sheets covering such a diverse range of latitudes (from the tropics to the poles) and altitudes (from sea level to over 6,000 metres), it is not surprising that there are regional variations in their behaviour. Such variability should not, however, distract from the broader and more important story unfolding, which is one of profound and likely irreversible changes to global land and sea ice cover. Taken as a whole, the evidence for sustained changes to the cryosphere is clear."